City of Wolverhampton Choir: Tenors needed! We need you for our Bach St John Passion Concert. If you are interested in joining us for our Palm Sunday (25 March) performance of this monumental work, you will be made very welcome at our Monday evening rehearsals at Cranmer Methodist Church, Newhampton Road. Rehearsals are from 7.30 to 9.30. Hope to see you there! 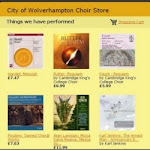 The City of Wolverhampton Choir evolved from the Wolverhampton Civic Choir and can trace its roots back to 1948. Currently the choir has around fifty members and usually performs three concerts a year within the city. We rehearse on Monday evenings at Cranmer Methodist Church, Newhampton Road. Our Musical Director, Brad Barlow, conducts a wide repertoire including some traditional favourites as well as some more modern works. The City of Wolverhampton Choir is a registered charity, number 1015173.